Replies: 155 (Who? ), Viewed: 246671 times. The MilkShape Plug-ins have been updated to a V1.01. 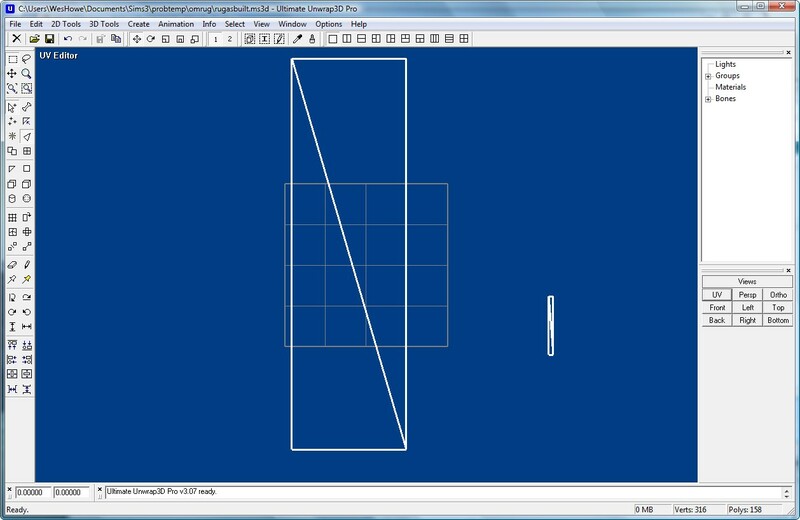 The ObjTool itself will not be updated, instead I have prepared these plug-ins to perform with the S3PE Object Meshing Helper that Inge and Peter Jones and Atavera have been working on. The changes involve some minor extensions to the .s3asc file format, and some tweaks to the 4th skin weighting. I expect that the new tools will be easier to work with, with a broader creator/developer support and have the potential to greatly improve object meshing on Sims 3. I have been informed that similar changes are being made to the object Plug-ins for Blender. You will note I am providing no links to this at this time, I am clueless as to where these new things will be posted. I believe this is a positive development for Sims 3 modding, enabling users to use a smaller set of tools, and to choose among different 3D programs to use in making their meshes. While it appears that only MilkShape and Blender have plug-ins that support the format, the format is public, and open for anyone else to use. Note the implication that the ObjTool itself will not be further updated. I expect the users will replace it with newer and better things now that they are becoming available. The ObjTool served its purpose, but as a piece of software development it has its limitations. A lot of it was written without a full understanding of some of the subtleties in the game file formats (MODL/MLOD) and a lot of things were sort of shoveled in (as you can see from the release history). In lieu of the complete rewrite it needs, I am choosing to support in whatever way I can the great work that others are doing. I am leaving the binaries for the ObjTool and the MilkShape plug-ins that should be used with it posted until such time as they are totally redundant. Of course, anyone is free to continue to use them so long as they want. V1.01: 20-Jan-2010 Fixed incorrect block listing on MTST for MODL file types, added type3 vertex, corrected wrong bounding box in MLOD. V1.00: 30-Sep-2009 Revised to default UVScales to 1/32767. Added check to release all file handles. V0.20: 16-Sep-2009 Revamped Dropshadow parts, again. Added Joint placement based on game file data. Revised licensing for plugins, seperate package. V0.17: 01-Sep-2009: Revised scaling for DropShadow parts. V0.16: 29-Aug-2009: Added MTST block listing to Info function. V0.15: 27-Aug-2009: Fixed UV Scaling, fixed shadow normals, added materials to decompilation/recompilation. V0.14: 14-Aug-2009: Added MODL bounds changes, created GUI version. Visual Studio 2008 runtime must be downloaded from the list? You should look in your installed programs. If you do not have the Visual Studio 2008 runtime installed, you will have to have it to make the plugin and program work. If you download them and they work, you already have the needed package installed. what milkshape folder do you put the plugins in? All MilkShape plugins should be installed in the MilkShape program directory, normally this is C:\Program Files\MilkShape 3D 1.8.5, but the name can vary depending on whether you are using Vista 64, the actual MilkShape version, or whether you made a custom installation. If you made a desktop icon for MilkShape, just right-click on that, choose "properties" and look where MilkShape is installed (the Target directory). Which Microsoft program is needed to run it? There are a lot when you click on the link. I downloaded "Visual Studio 2008 Shell (isolated mode) with Service Pack 1 Redistributable Package", the 3rd from the bottom, and installed it, but when I clicked on the program it said it couldn't open. I downloaded that one because it was relatively small compared to the others. Is there any specific program we need to install from Microsoft or should it be just any of those? Thanks for your help. You want the "Visual Studio 2008 Runtime" package for your computer, either x86 or x64. This may already be installed, you can check in your installed programs listing. There are 32 and 64 bit versions of windows, you have to pick the one for the version installed on your computer. Wes, this latest version (downloaded today 13th September) doesn't seem to be putting the wallshadow into Milkshape, so I can't change the size to suit my new window meshes. The group for it is there, but the only thing that seems to be in that group is the joint, not the shadow planes. The shadow plane is very small now, 1/128 the size it was before. You have to zoom in real far to see it. I'm not convinced it is right, either, but at that size it works. To make it larger or smaller than it is, the easiest way is to scale it. You just select the group, then put perhaps 1.1 in X and Z an 1.0 in Y and click Scale. Voila! it is now 10% larger. It's there, it is now just very small when viewed in MilkShape... hidden in the little blue thing. If you unclick "show skeleton" the joints will not be seen. The previous scale I used was not right for the dropshadow mesh parts, they appear to have their own special formatting, different from regular mesh parts. Their biggest purpose seems to be not as a mesh itself, but used for UV mapping to the right part of that DDS file that says "do not use any blobs below this line". Well I don't understand now how I am meant to get it the right shape and size for my window? Ie, how to work with it? Obviously I daren't actually make it the same size as my window to work on, or else I might fail to resize it down properly again. At the moment in my game I have a huge original-sized shadow that is quite wrong for my new window. Just scale it. While this is hard to use, the old one was the wrong size. Since it didn't display anyway, because of an error on my part, it didn't matter that it was teh wrong size. After I made it work, the size became an issue. 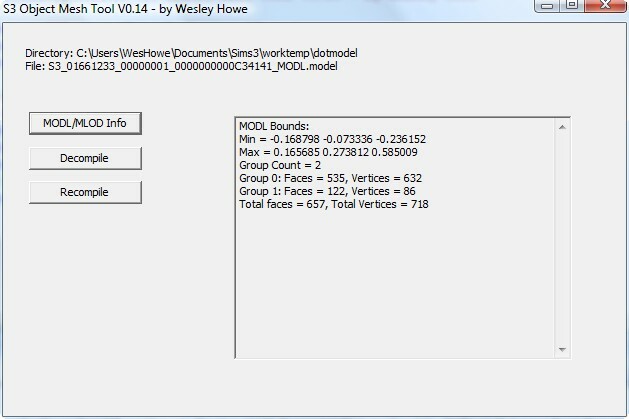 In the 'Tools' menu for MilkShape is an item "Show Model Statistics" that will tell you the bounds for an object. Load in the original mesh, see how big it is, load in the new one, see how big it is, scale the dropshadow accordingly. If you can manage C++, you can work the fractions to get a scale value. Just remember, Y is Up. Do you think that will work in the game? I really can't work on the shadow without being able to use it in the same MS session as the frame. Is it possible for your importer and exporter to handle that rescaling automatically to facilitate the editing? I will ponder how to do this automatically, I am sure it is possible. It just means "Dropshadow" shaded meshes will be on a different scale than the regular items, everything else about them is different, anyway. Alas, having never seen the original EA files or code, I have no way of know what exactly they do. I can only guess from how their code reacts to different values, and learn only to feed it what it wants to see. Well you can import something to MS, and export it without editing, and something complains about coordinates being off the map. So I don't know what all that is about. I end up havnig to open in UVmapper and pull the outer vertices in a bit. Give me an example of which item... I though I had that fixed. It is a small rounding difference, perhaps out to many decimal places. I am testing your recommendation right now, I think it will work nicely, look like the old, scale special because it is a dropshadow. It was the country window without the flowerbox. The one that looks like the one with the flowebox but without. I don't know, Inge, I couldn't replicate that. Did you run it through UV Mapper in the process? All I did was decompile/import/export/recompile. I added a teeny slop factor to the check routine. I think what is happening is that U or V values like 1.00001 end up existing, and those evaluate to > 1.0. The check exists to make sure that what is being compiled stays in the 0.0 to 1.0 range, after scaling, unless you intend it to be different. Going out of range makes the texture mapping wrap around, say the left edge is over to the right of the right edge. Thanks for the report, though. I am going to make a release soon, I am just waiting on one other item that will be included. Can you explain what the 0.0 to 1.0 range is? How much of a gap do I have to leave between all the pieces and the edge of the square they are laid out on? BTW, after editing the shadow and shrinking it again it disappeared completely. UV coordinates are normally pairs of values in the range of 0.0 to 1.0. In TS3, these values are compressed, and instead of using a fixed value "scaler" the software EA uses generates a "UV Scales" value which may be larger or smaller, depending on how much of the area in the original UV map was used. The texture maps were then made, using the scaled UVs. So there are several important side-effects that happen from this. If a UV point is placed right of or below the positions used in the original EA mesh, when these are scaled they will go off-the-map, exceeding 1.0 or dropping below 0.0 (negative values). That is what the check is complaining is happening. If you want to change the UV Scales value, it can be done, however all of the texture maps will need remade. This is only viable when you are planning a new mesh, new texture item. Doing what you are doing, modifying original objects, will require that you stay withing the confines of the UV mapping used in the original UV map. What I mean is that is that any new or changed UV points need to be no lower than the lowest or right of the rightmost points used in the EA made mesh. Doing so will generate the warning. Oh so there is no very good way of knowing in advance whether your map is acceptable? I wish .obj would keep bones cos UVmapper is much easier to use than MS mapping window. I agree with you on the utility of MilkShape's Texture Coordinate Editor, I do not use it much myself. As for knowing ahead of time, you could load both the original and your edited map as separate groups into UV Mapper, and check if any of your new points are "East" or "South" of any of the original UV coordinates. Most of the UV maps seem to use the majority of the area, but few are mapped all the way to the edges. Nonetheless, when trying to maintain parts of the original clone, such as some of the texture maps, you have to stay with the original scaling. If you are redoing it all, then you can change the UV Scales value. I already ranted about this in some other post, so I will spare you my arguments about it being over-designed, it is truly a solution in search of a problem. However, there is no simple solution I have seen that preserves the ability to partially modify meshes without restriction. This issue is not a problem for EA, since they are building the packages for these items from scratch. Were that the only option (start from scratch), I could build a scaling change into the exporter and you would never have any issues like that. I posted this elsewhere, but this is a pic of a UV map that goes out of bounds.